This is really not my fault. I can't help it if I'm surrounded with wonderful cooks who like to get together so I can enjoy marvelous food every Monday. Nor can I help it that it's the holiday season, and lots more wonderful things will be coming my way. And I really can't help it that JAG and Elsa decided to throw an on-line sandwich party this weekend. I really intended to go get ingredients and put together something, but after seeing the chip butty and ham-and-mac-and-cheese, not to mention other wonderful concoctions, I realized I was outclassed and so opted out in favor of a local delicacy. This is a Hungry Hillbilly. 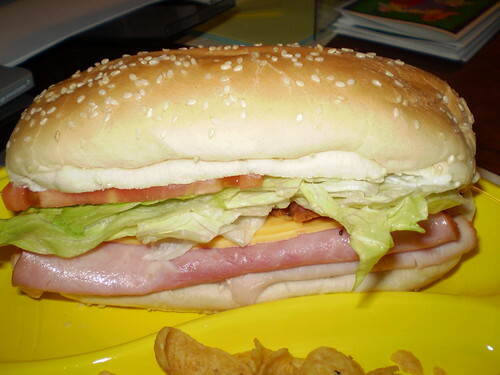 Made with care by Charley so I could take the perfect photo, this stately sandwich is comprised of turkey, ham, American cheese (of course),bacon, lettuce, tomato and mayonnaise. I usually skip the tomato, except for when they are in season locally, and I generally have the lovely girls at Poor Farmer's Market, where this sandwich is created, add onion. This sandwich is probably better heated, but I like it fine cold. There is some debate among the natives as to the perfect accompaniment to a Hungry Hillbilly. I generally go for Lay's Sour Cream and Onion potato chips, while others prefer BBQ or even Salt and Vinegar. Today I chose Frito's Original Corn chips, because Dad had some last night and I've been wanting them ever since. Liquid refreshment is also varied, with everything from Bud Light (but not at the store), white or red wine and bottled water enjoyed with the sub. Carbonation is generally preferred; I like a good old Diet Dr. Pepper. And I have to read my current book while I'm enjoying my meal. 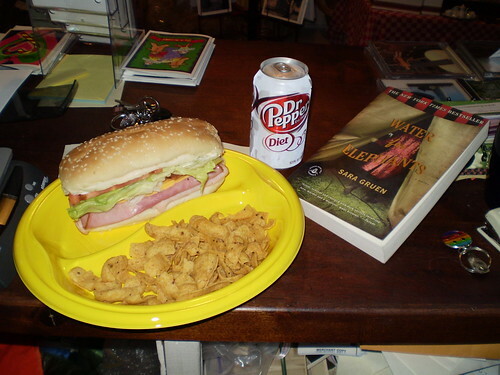 So now I'm going to go enjoy my sandwich, since blogging the same has taken longer than eating it will!